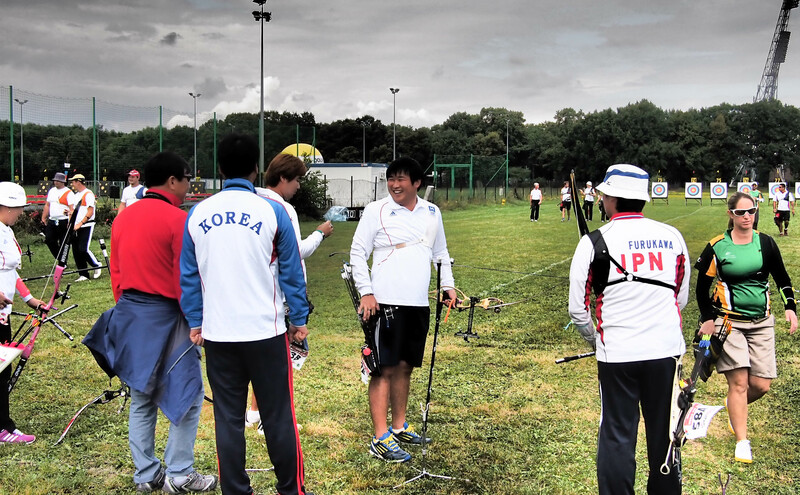 This is a video I took of Lee Seungyun, the World Cup champion, on the practice field in Wroclaw. He’s only 18. That’s… painful. I particularly like the smoothness and the way he doesn’t fully extend his bow arm until he’s halfway through the draw. That’s got to save some energy. His head and torso are perfectly still. And note, as previously mentioned, his extended and interestingly trimmed tab, which he was kind enough to let me photograph. 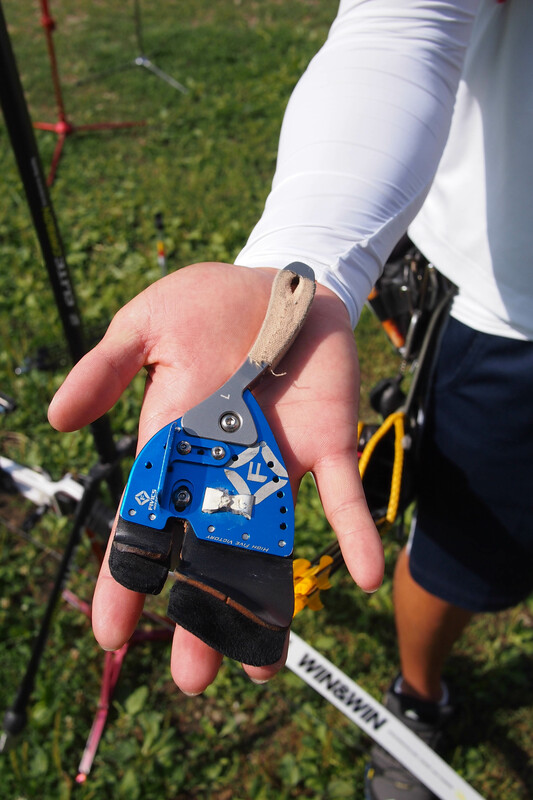 There’s an often cited ‘secret‘ from the Han peninsula for continued archery success, which doesn’t appear to be backed up by much scientific evidence, unfortunately. Of course, it’s not the equipment, or even his particular style, or the chopsticks. 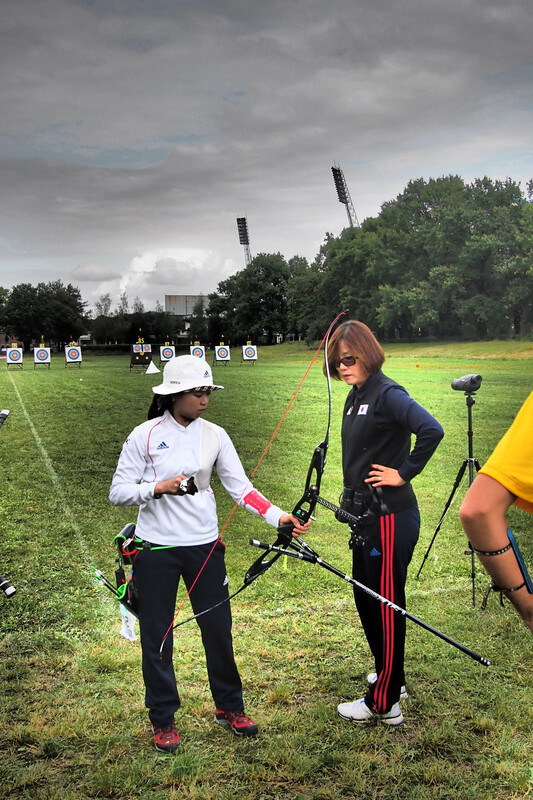 It’s the vast youth base, relentless dedication, mental toughness, brutal 1000-arrows-a-day training regimes, regimented coaching structure, clear career paths and professional teams that are the reason why the Koreans destroy almost everyone at top-level recurve archery. 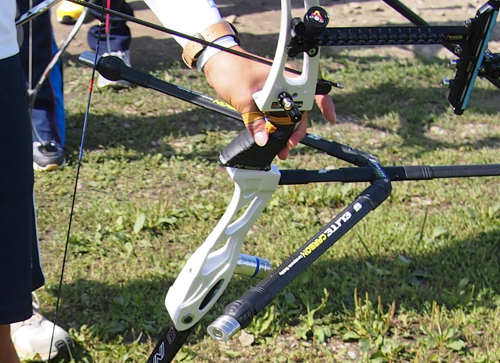 The real Korean archery secret is this: make sure you are better. I arrive in Poland like a hurricane that’s just been downgraded to a tropical storm. 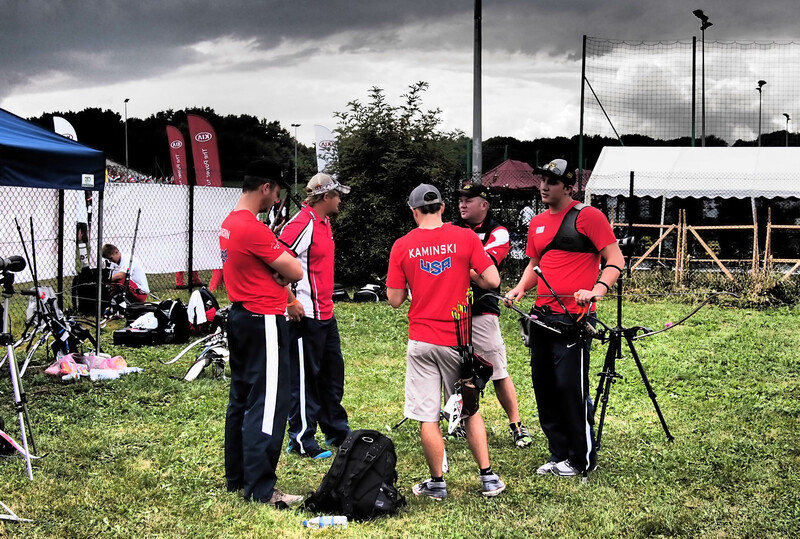 I am knackered from a stupidly early flight from London; luckily World Archery are kind enough to pick me up from the airport for a token exchange of zloty. 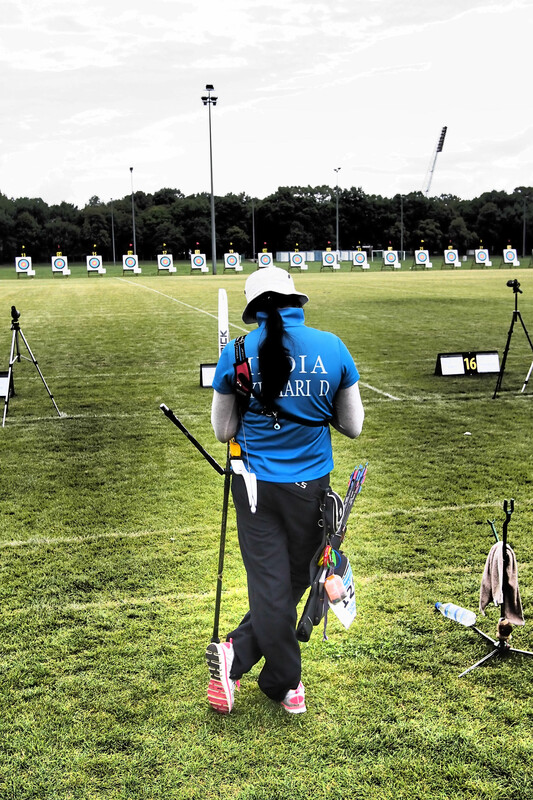 I get to the field just as the mens and womens compound qualifications are winding up. Two football fields knocked together in the shadow of the Olympic Stadium, built in the 1920’s when Wroclaw was still a part of Germany. Apparently it was renamed with the ‘Olympic’ bit in the folorn hope of hosting some of the 1936 Berlin Olympics. You know… that one. My host is Maciej. He has a dry, and frankly, British sense of humour. I like him immediately. I am given a green ‘media’ bib that makes me look like a fat leprechaun linesman. Just as I arrive, double World Cup champion Sergio Pagni breaks the European record for the 50 metre compound round with a staggering 714 out of 720. He looks superbly pleased with himself in the awesome way only an giant Italian man can be. “Can I take one more picture?” “OHH, yes.” What a man. I get the largest coffee I can scrounge. It’s pretty easy to tell how things are going even without the single scoreboard screen next to the entrance. You can easily see an air of despondency hanging over some of the camps. They play some frankly strange choices of music in between ends; I hear ‘Punky Reggae Party‘ closely followed by ‘Bette Davis Eyes‘. (Still, that’s better than whoever was ‘DJing’ at London 2012, when Lords was treated to the Macarena just after a crucial semi). 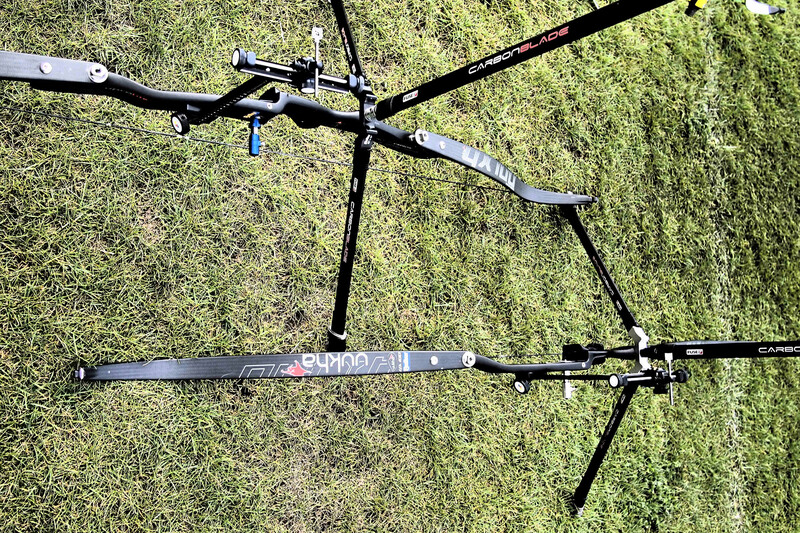 Slowly the forests of expensive hardware, mostly Hoyt, are packed away and the targets get moved back to 70m ready for the recurve men and women. There’s a five-way shoot off for the coveted eighth spot won by Dave Cousins. 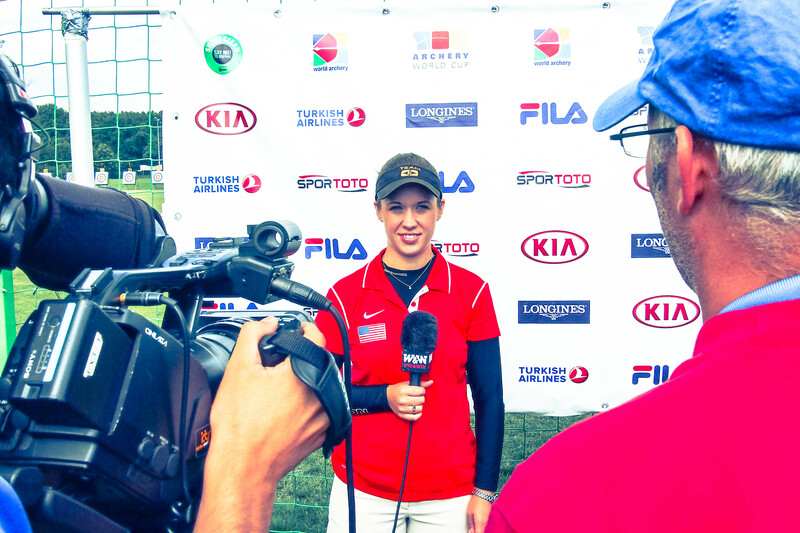 Erika Jones of the USA came top of the women’s ranking, and submits to an interview. Danielle Brown and John Stubbs, two of Team GB’s finest, are solidly placed for the next day. A dozen nationalities. 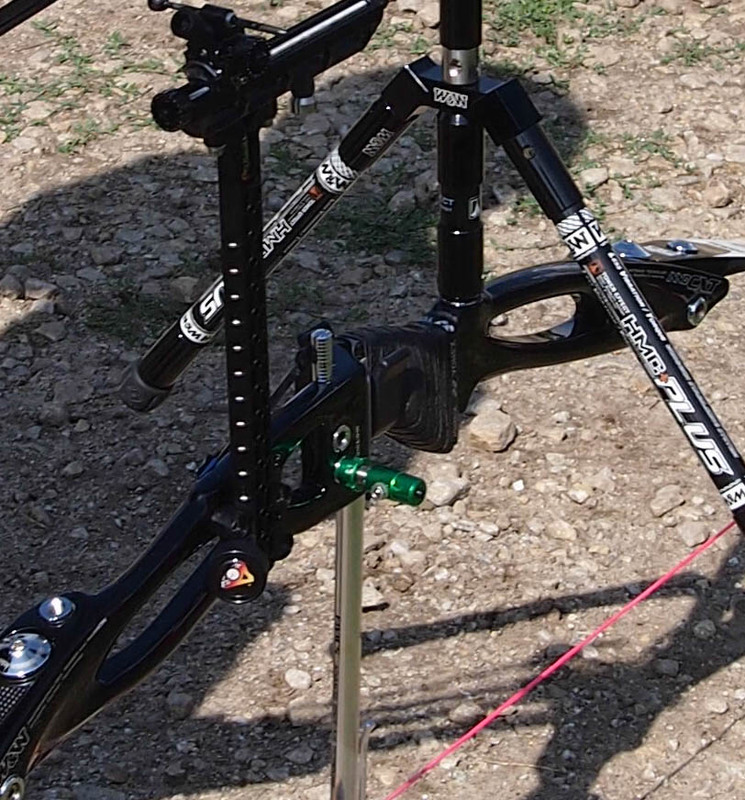 It’s a bit of an archery nerd’s paradise. You only have to turn round too fast and you realise you’ve knocked over Viktor Ruban‘s bow stand. Look! there’s… oh, and… and… OMG!… wow, that’s… everybody. The collective talent is terrifying. I even get a smile and a respectful nod from Dean Alberga, the international archery photography capo di tutti capo, resplendent in his ‘Media 01’ bib. 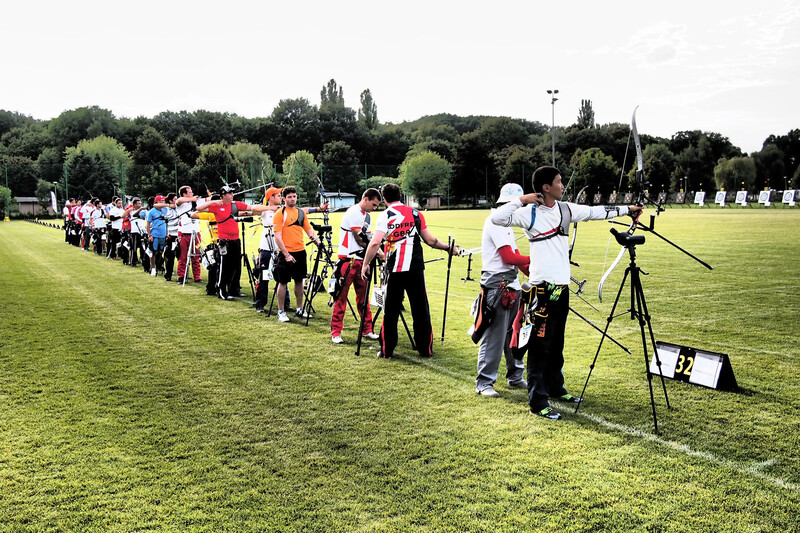 The recurves are warming up in the practice field next door, including a full-strength Korean squad, all of whom are byed straight through to the next day after an utterly dominant display in the qualification FITA round on Tuesday. Teams wander past. 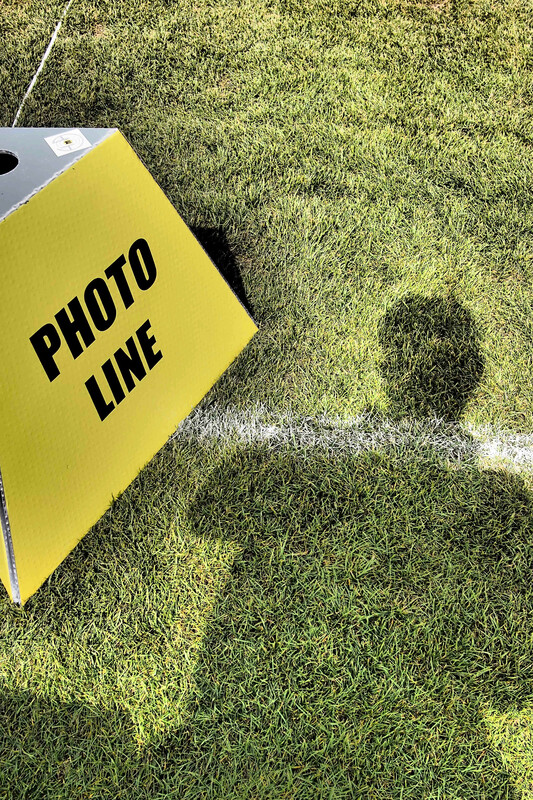 Coaches are spread thinly amongst three man or women squad members, who might be eighty metres apart down the field, and have to frequently split loyalties. I speak to the ridiculously young Becky Martin, who is on her own waiting to start the 1/48 eliminations. 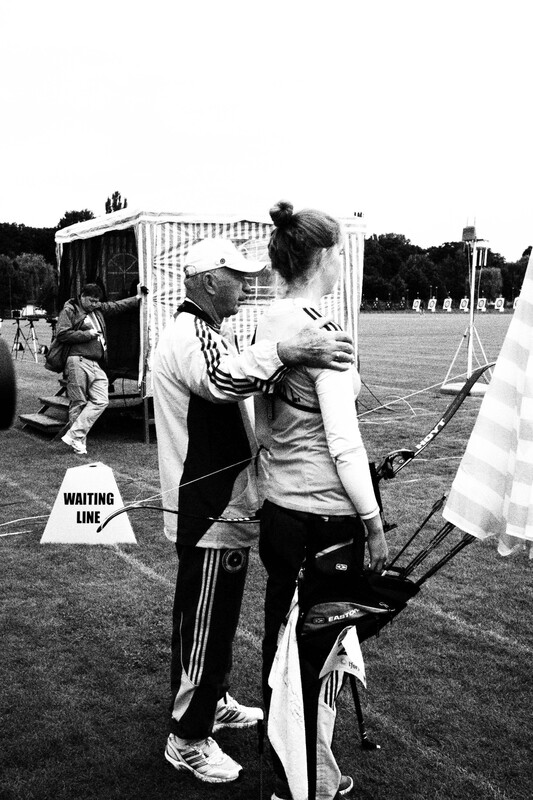 She did well yesterday, coming 36th out of 90, in her first World Cup. How do you feel, Becky? “Pretty good, was pretty happy, made the top half of the draw.” How was warming up this morning? “Just did a bit, not too much.” Her bow shoulder is troubling her. What’s the problem? “Not sure, I don’t know anything about anatomy!”. She seems confident though, and proves it by hammering Holly Stover of the USA 7-1 in the 1/48. I watch Amy Oliver‘s shot cycle carefully. Her technique is fantastic, but the pause after each shot, where she collects herself, head down, looks like she is staring into an abyss of her own making. Whatever. She beats her first Turkish opponent convincingly. 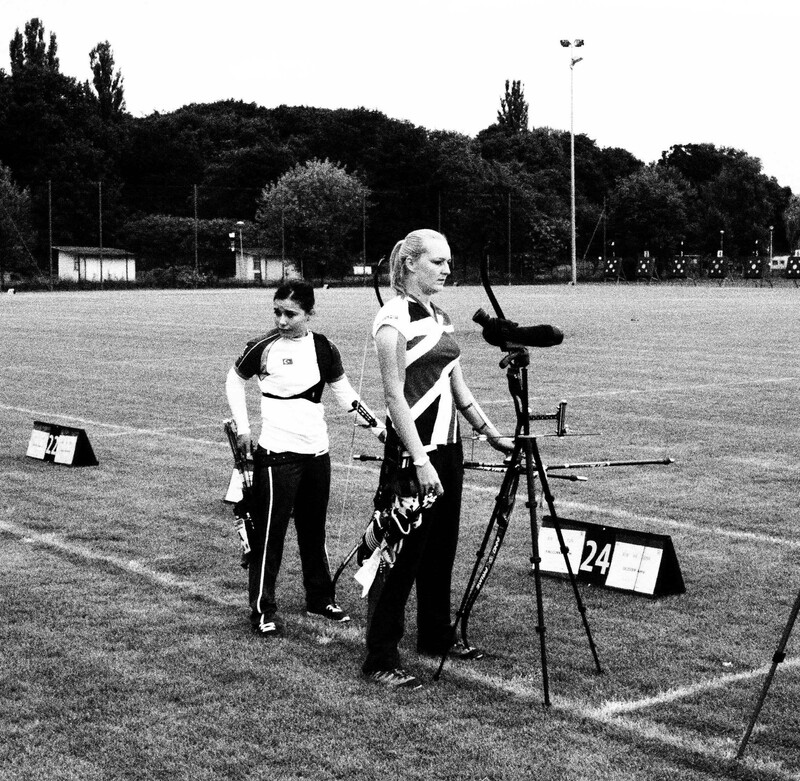 In the 1/24, I watch the match between Elisa Barnard of Australia and Ika Rochmawati of Indonesia; where the collective support of Archery Australia has lent proceedings more of a Test cricket feel than most matches this evening. Unfortunately, she slumps to a defeat, as does Rebecca Martin. Naomi Folkard, conqueror of the World Games, goes through to the last 32 against Jennifer Hardy of the USA who is still wearing a shirt with her maiden name on the back. 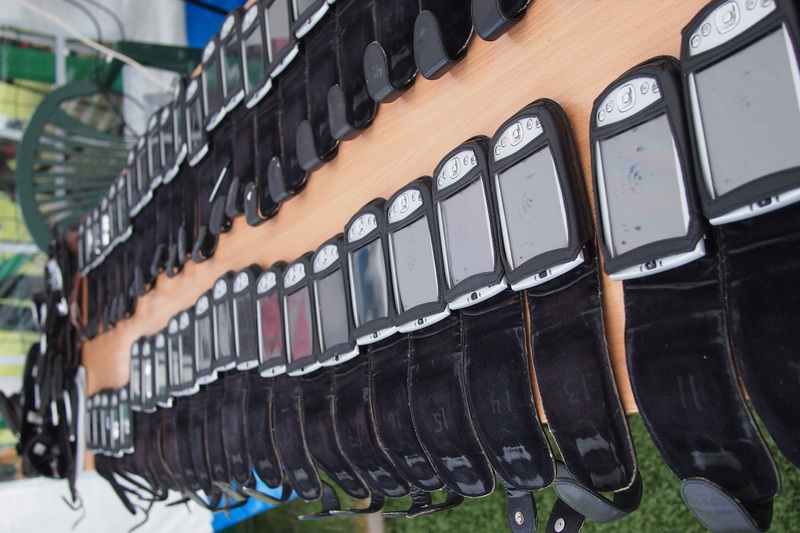 …and finally change the resolutely manual Velcro scoreboard below the targets. Of course, I should have brought a scope or binoculars, like the vast majority of participants. Team GB have had a fairly ropey day; Larry Godfrey is out. A final trace of sun does a late streak across the field. It’s the kind of light I have been hoping to take photographs in all day, but unfortunately things are winding up, finished by an exciting double shoot off between Daniel McLaughlin of the USA and Bernado Oliviera of Brazil, the first of which is deemed to close to call. There’s a slightly downcast collective air as everyone trudges to the buses, a mixture of exhaustion and the terrible ennui, for half the recurvers, of failing to make the cut. In Four Iron In The Soul by Lawrence Donegan, one of the best books about golf ever written, the constant misery of failing to make the cut, the next day, is replayed endlessly. The emotional turmoil of matches that you know, deep down, that you could win – but don’t – must eat into these people’s souls. Not everybody, though. Deepika Kumari sits in the seat in front of me, and softly sings all the way back to the hotel. Full scores for the day are here. Many more pics here. 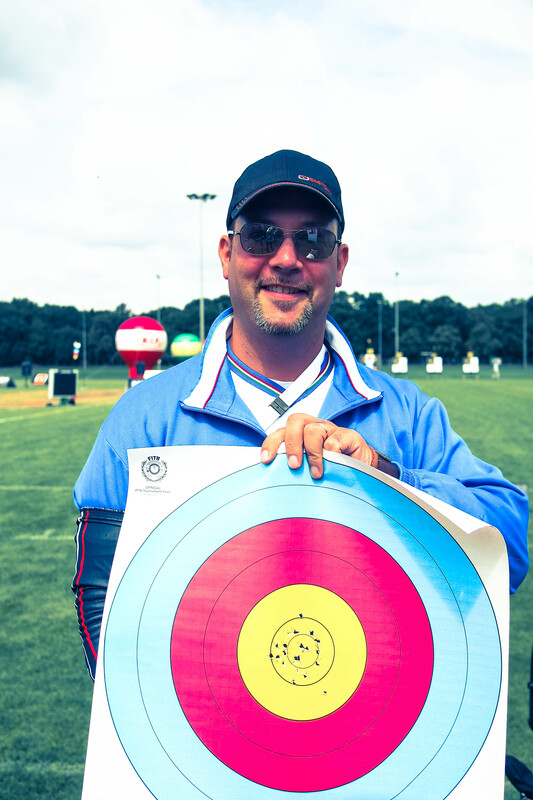 Tomorrow: mixed teams, compound eliminations to the last 32, recurve eliminations to the last 2.